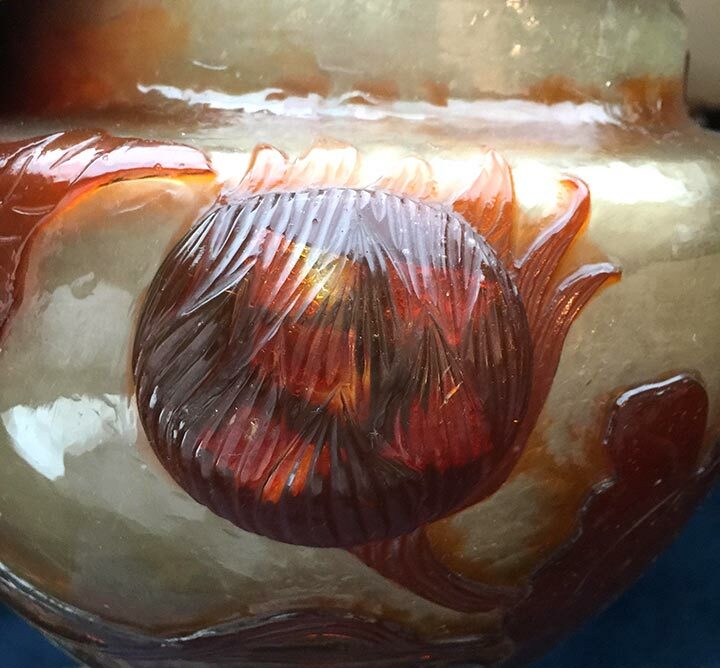 What was so special about a Daum vase I recently sold? 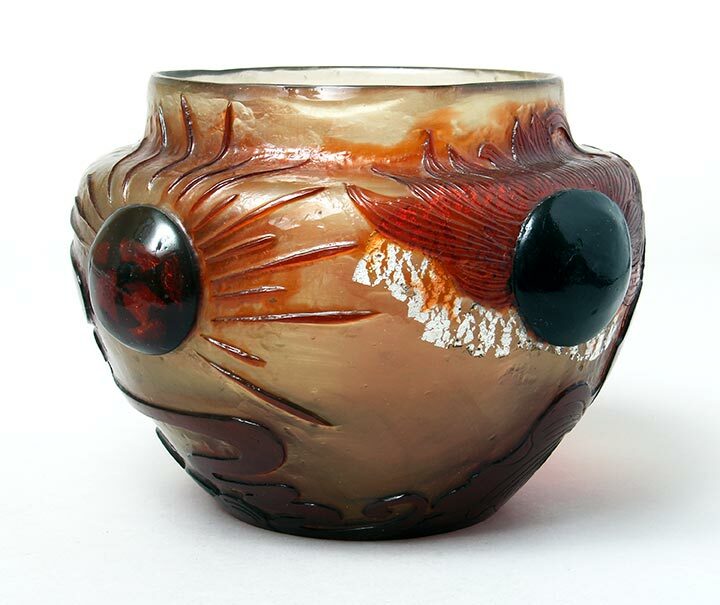 I recently sold a small Daum vase that looked innocuous, but was actually special. Let’s take a look under the hood. 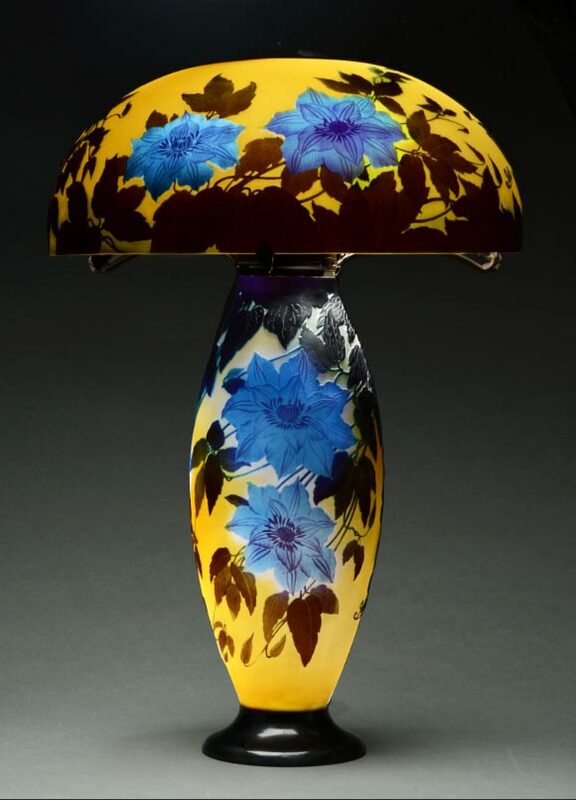 First we have to look at the single flower, whose center was molten applied with blue internal coloration during the making of the vase. 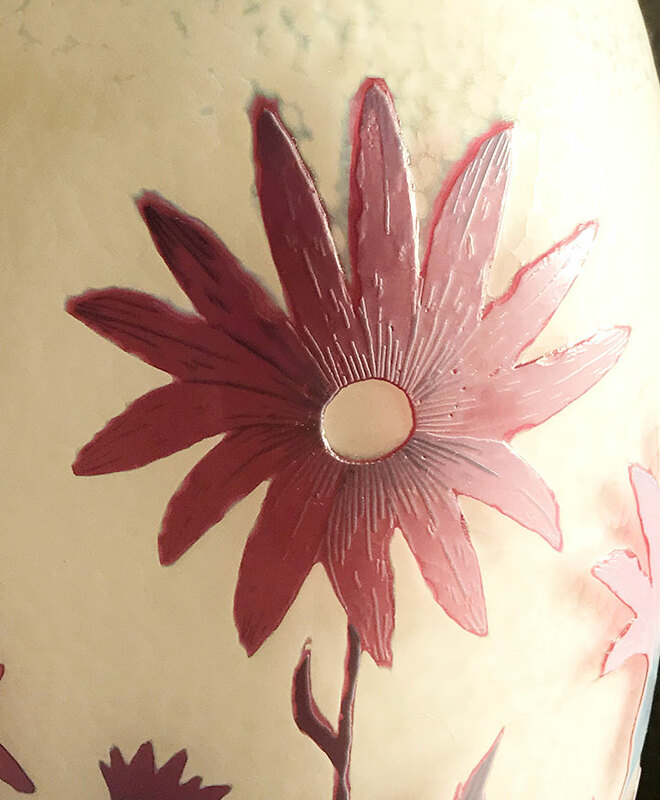 After cooling, an artist hand-engraved (wheel-carved) a bumpy texture (martelé) onto the flower center and details into all of the leaves. 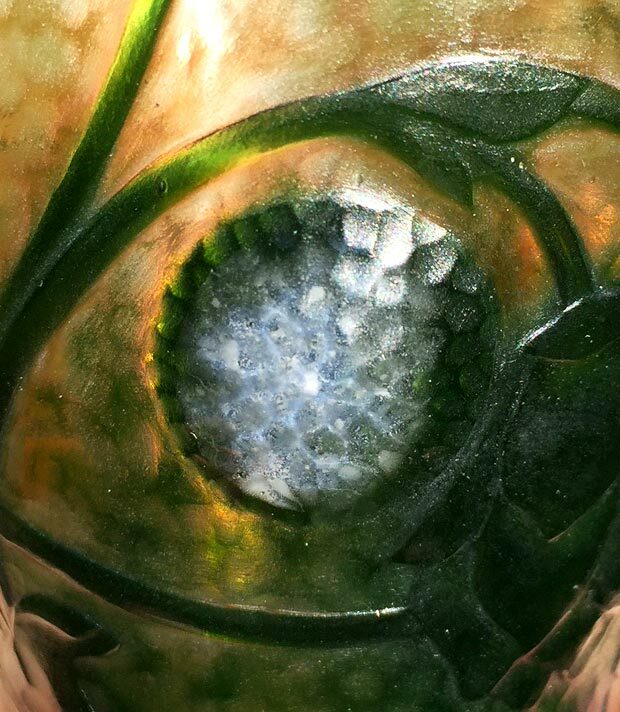 To complete the vase, the artist carved a martelé texture into the background and the foot rim. Daum vases with wheel-carving often had hand-engraved signatures, as was the case with this vase. 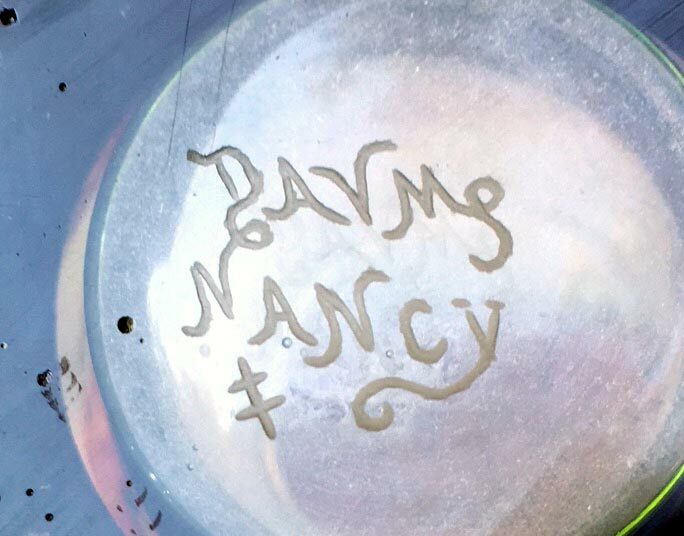 It’s fancy, textbook-perfect, and found on the underside. 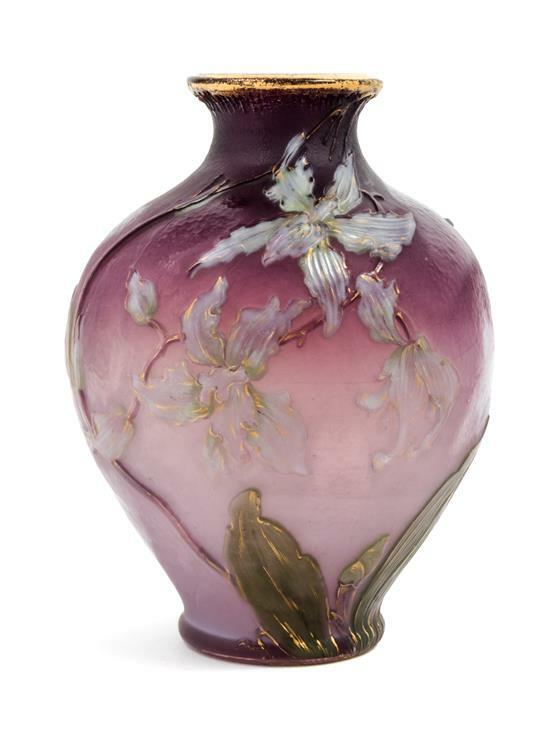 The vase wasn’t very flashy or colorful, but it was sophisticated because of the number of difficult techniques employed in its manufacture. 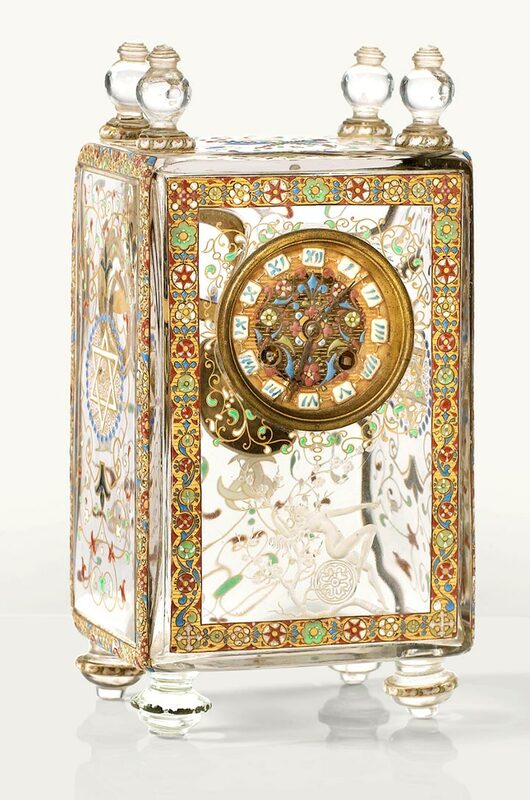 That and the high-quality workmanship made it special. 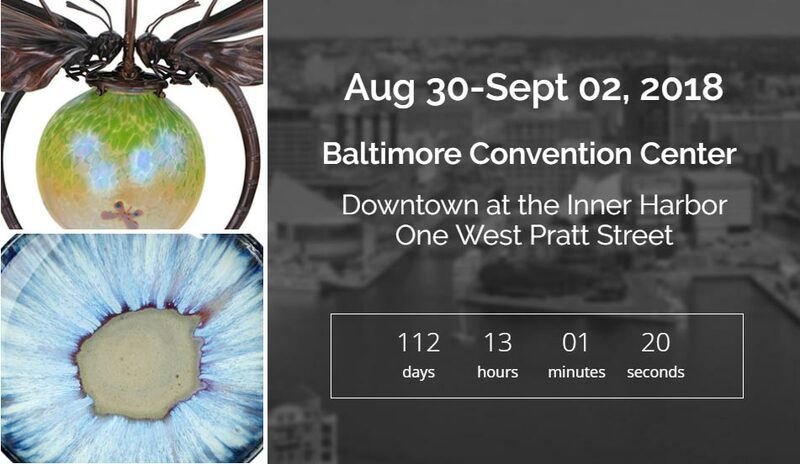 The Baltimore Art, Antique & Jewelry Show is now only six weeks away, at the end of the summer, August 30 – September 2, 2018. We were forced to give up shows like Denver. Unfortunately the Baltimore show promoter has moved the show one week later than usual, to the Labor Day weekend. The show used to be held over the Labor Day weekend, but that was many years ago. 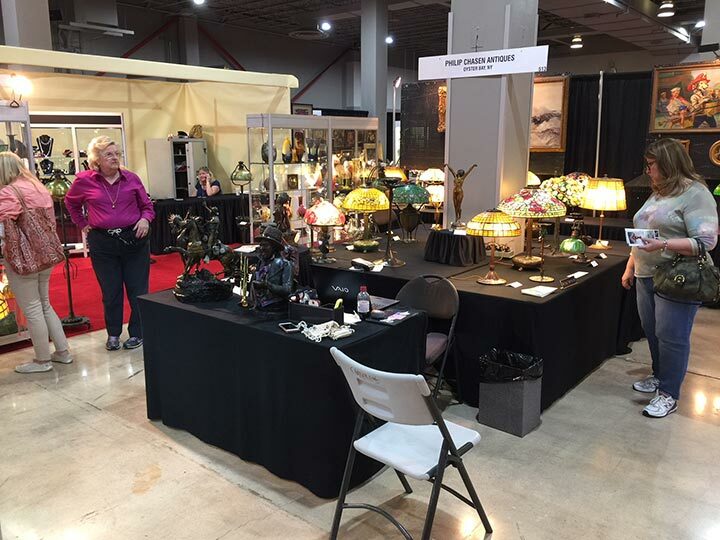 The show is wonderful, so we’ll continue to exhibit there regardless of the change of dates. Please note that I am permanently changing Thursday’s post day to Friday. My goal is to publish new posts twice a week — Mondays and Fridays. However, if you don’t see a new post on Friday, it’s because I was too busy, so please look for a new one the following Monday. Every once in a while, I will re-post one of my most widely viewed blogs of the last nine years. This is one of the top three, originally written on September 14, 2009. 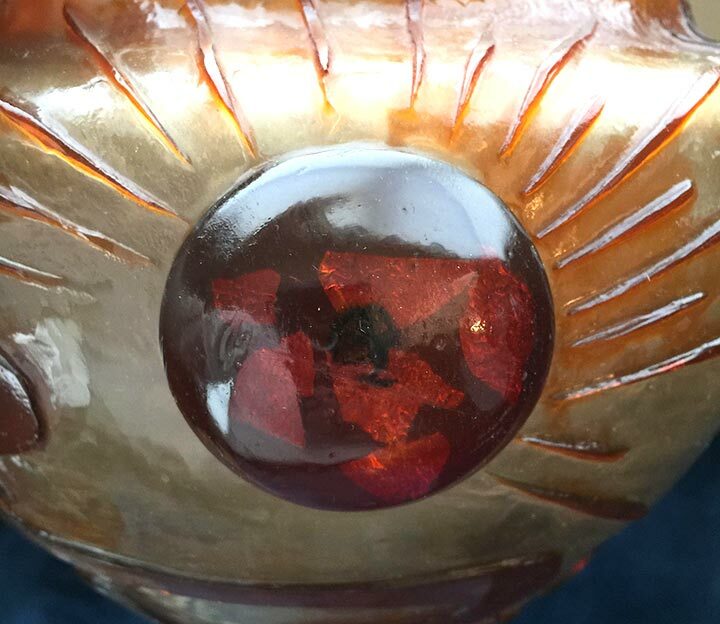 Having sold many thousands of antique glass vases over the years, I’ve learned a lot about how to clean them from trial and error. It also doesn’t hurt to have a Master’s Degree in Chemistry. 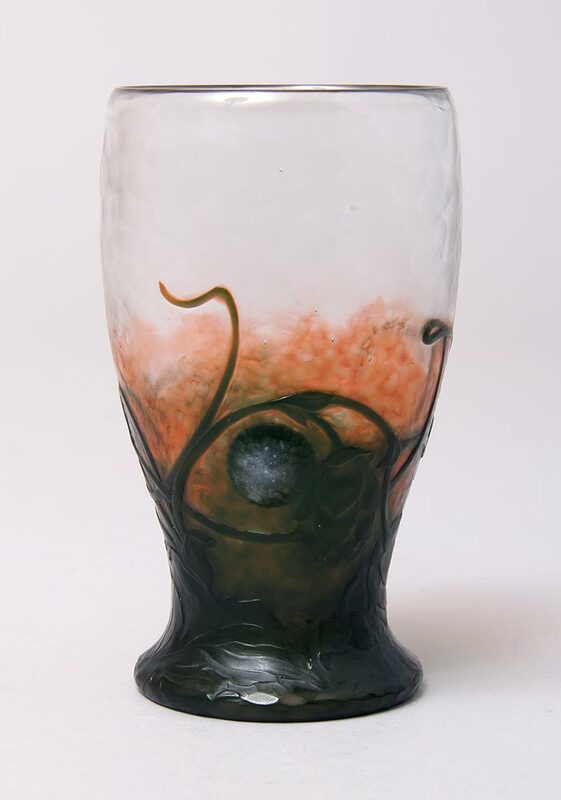 Most people are quite timid about using chemicals on glass. 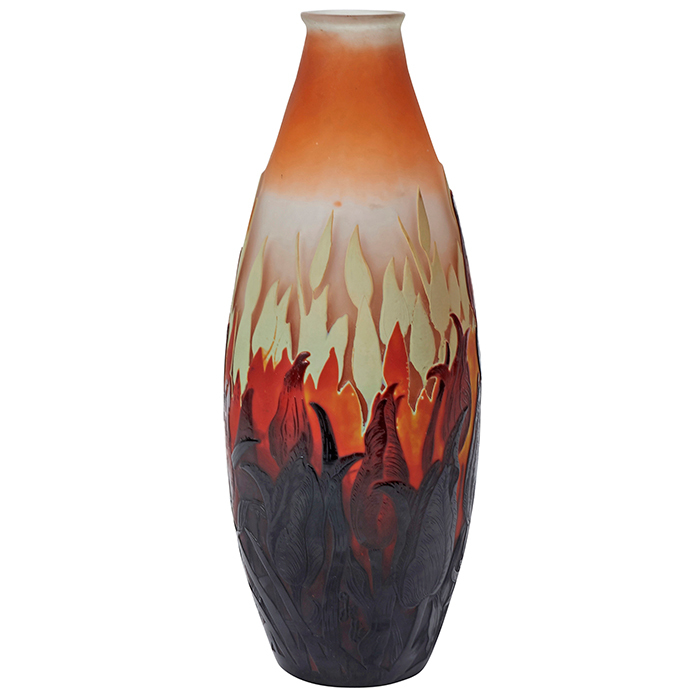 They’re afraid they’ll ruin their vases by removing the decoration or somehow damaging them. There are very few times this would actually be true. 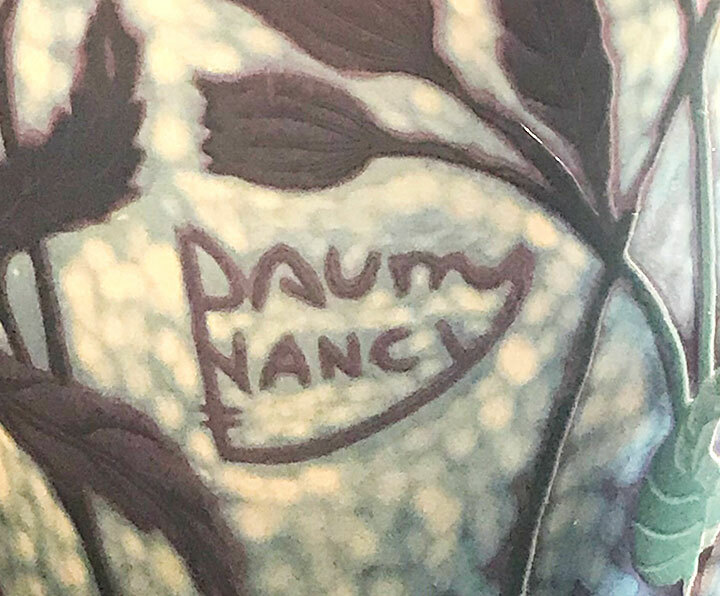 Cold-painted decoration on a vase could be ruined by the use of some chemicals but Tiffany Favrile vases and French cameo vases by Daum, Gallé, and others have no cold-painting, so all of the steps I describe below are appropriate. 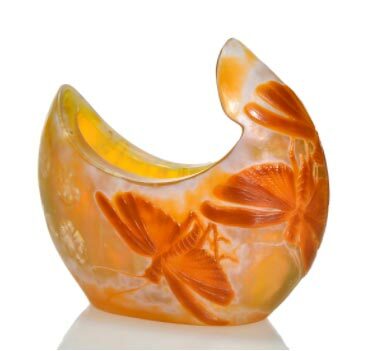 If you suspect that your vase has cold-painting on it, test a small area with one of the cleaners below, using a Q-tip. If any color comes off, stop and use only the mildest cleaners. The first step is to remove any sticky substances, which will dissolve in organic solvents such as mineral spirits or acetone (nail polish remover). There are also some good commercial products available, such as Goo Gone, available at stores like Home Depot or Office Depot, or online. 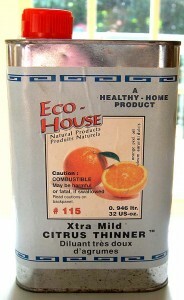 Another product I like is citrous thinner, made from orange peels. It smells a lot better than the other solvents and is quite effective. Click here if you’d like to order it. Start by looking for anything sticky with your eyes and your fingers. Put very little solvent on a Q-tip, rag or paper towel. Rub the affected area until the dirt or stickiness is gone. Mineral spirits is a gentler solvent than acetone, so try it first. Mineral spirits is especially good for removing the gum from old labels. Use acetone second, if you need a stronger solvent. These various solvents will also remove crayon, sap, or any similar substance. Next we’re ready for aqueous cleaning. I suggest you do this in a sink. 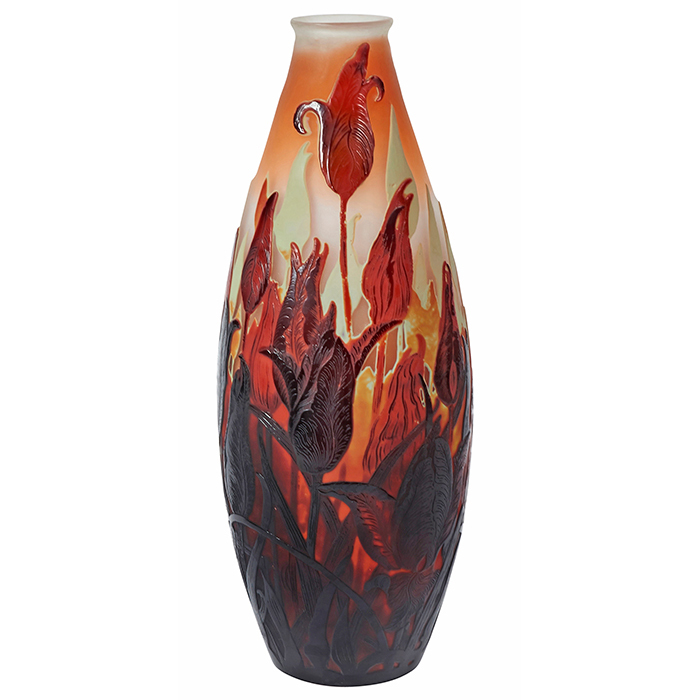 Most of the cleaners will make your vase slippery, so be very careful not to lose control and break it. The gentlest cleaners are dishwashing liquid or Windex. I like to use them with an old toothbrush. 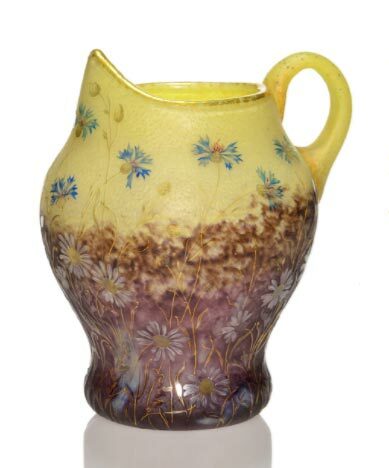 Scrub the vase with the first cleaner and see if the dirt comes off. If it’s stubborn, you can proceed to the next level of cleaning power with commercial products like Scrubbing Bubbles or Dow Bathroom Cleaner. Repeat the process. 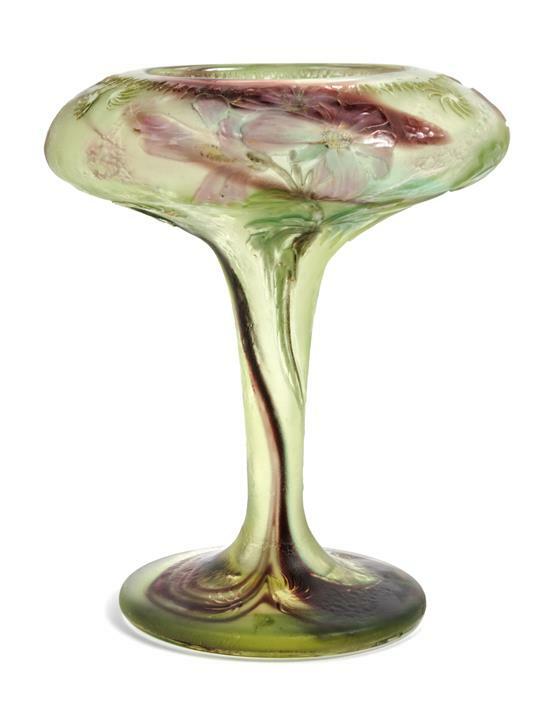 Spray the vase, let it sit for a few minutes and clean again with a toothbrush or similar brush. If that’s not strong enough, you can go to the highest level of cleaning power — Easy-Off, of which there are two types available. The blue can, labeled “Fume Free” is the one I recommend. (It’s not really fume free, but it’s not too bad.) It’s powerful and should remove any leftover dirt. 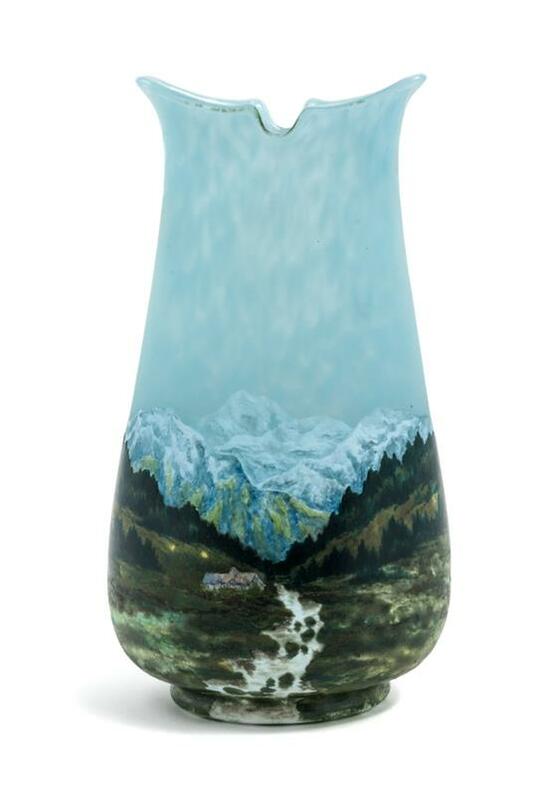 Finally, rinse your vase thoroughly in plain water and dry completely with an old towel. If it’s safe, let it dry upside down. It’s a good idea to use gloves to protect your hands, an apron to protect your clothing and glasses to protect your eyes. Easy-Off in the yellow can is lye (sodium hydroxide). It’s very powerful. It will eat through the dirt nicely, but also through your clothes and skin, and can severely damage your eyes. Immediately flush with plain water if you have an accident. You’ll know you’ve gotten it on your skin if it feels slimy. 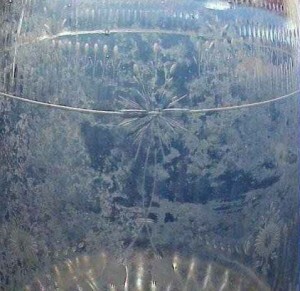 Vases that have been filled with water can present bigger problems, such as scratches on the interior. 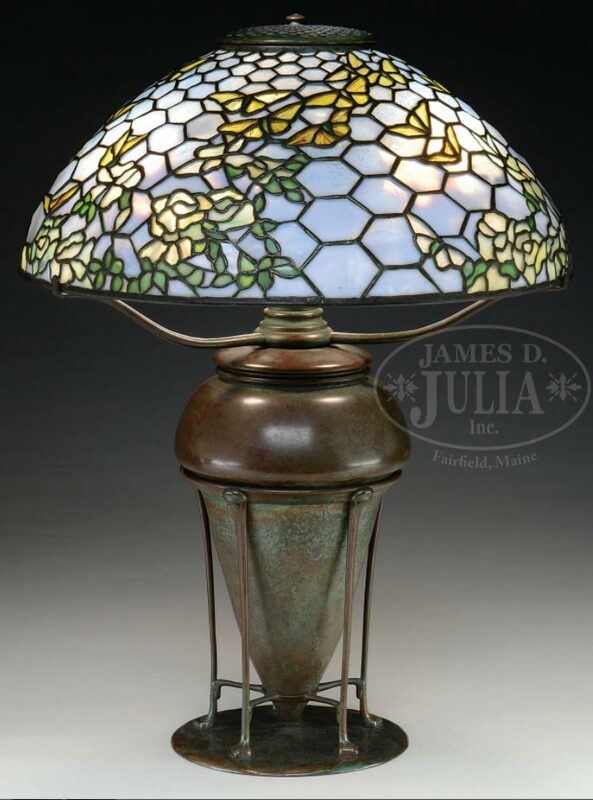 The second and more serious problem is sick glass, which includes etching of the glass interior or the depositing of lime or other minerals. 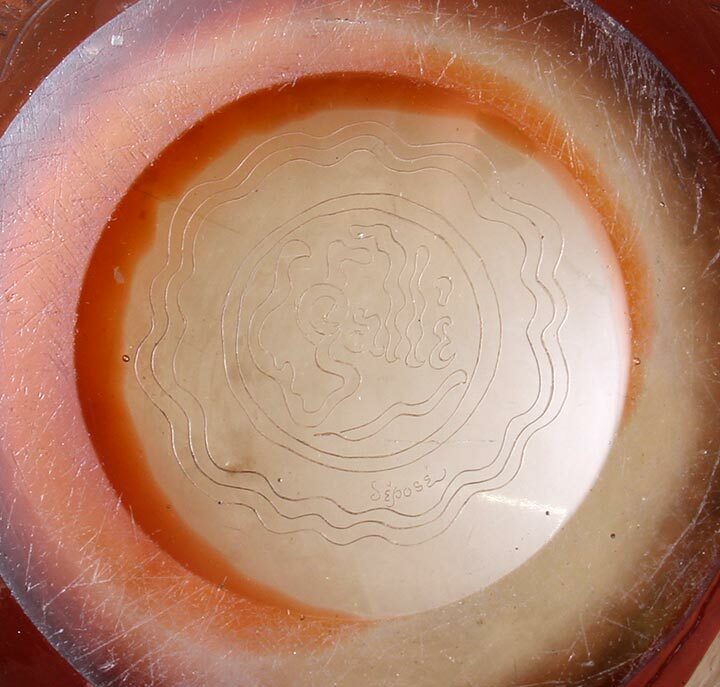 Etching will appear as frosting, while depositing will appear as white crust. Cleaners will not effectively fix these problems. The only real way to treat problems of this sort is to go to an expert who can “tumble” the vase to resurface the interior. 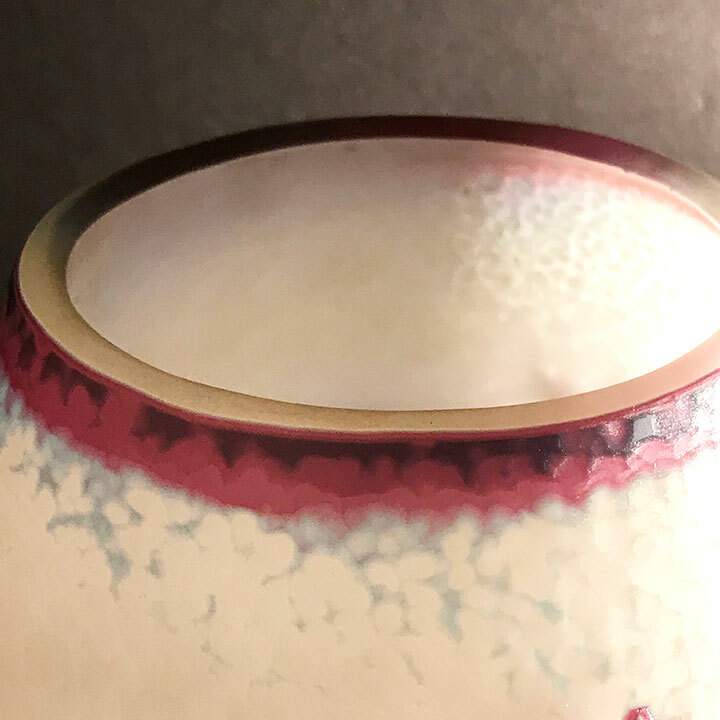 It’s basically the same as sandpapering the entire interior — great for a transparent vase, but not as good for a vase that has a finish on the interior, like an iridescent vase. 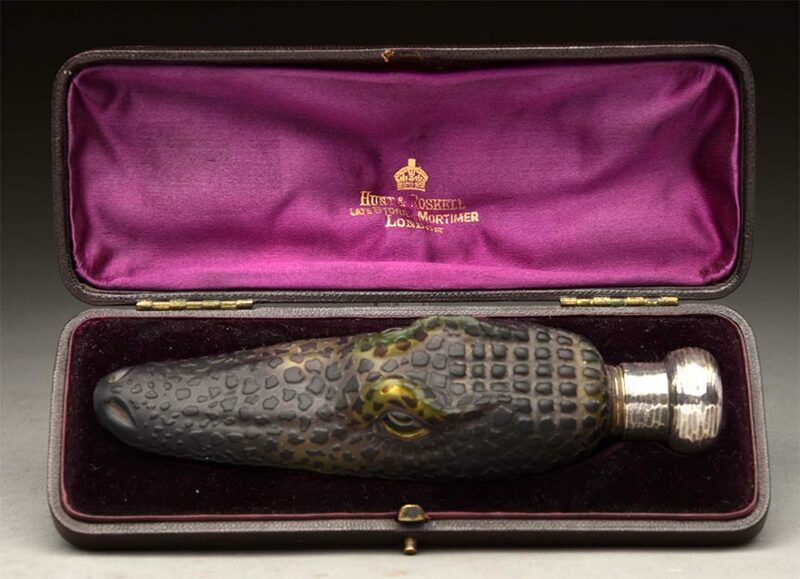 Use this link for Paul Nulton, who used to do this kind of work, but may or may not still be in business. 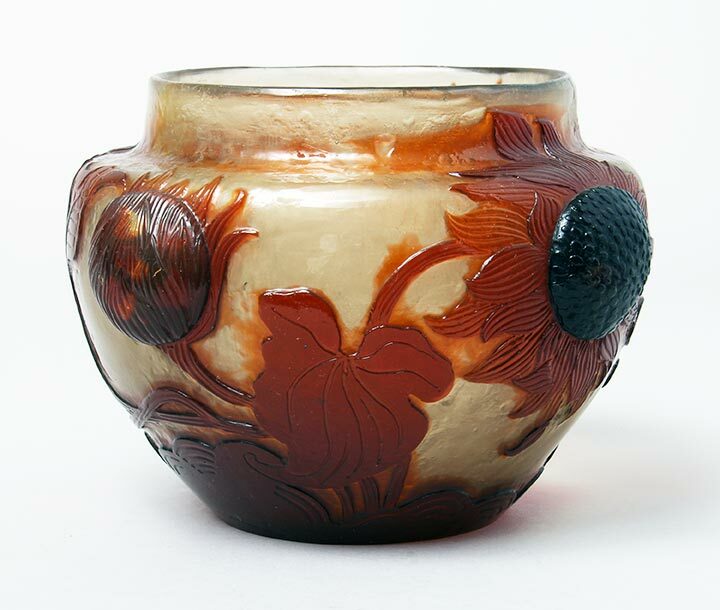 Sometimes vases were kept in homes where the owners smoked or had smoky fireplaces or stoves. 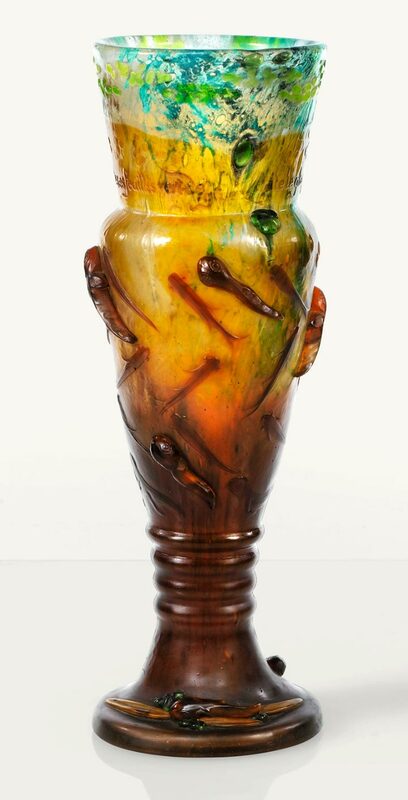 The vase will probably appear to have dingy color. 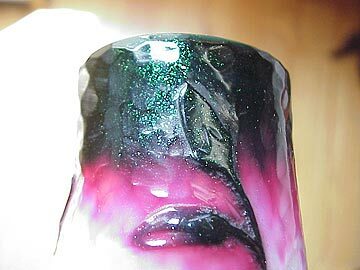 With a minimum amount of effort, the results can be quite gratifying, revealing unexpected bright and beautiful colors! 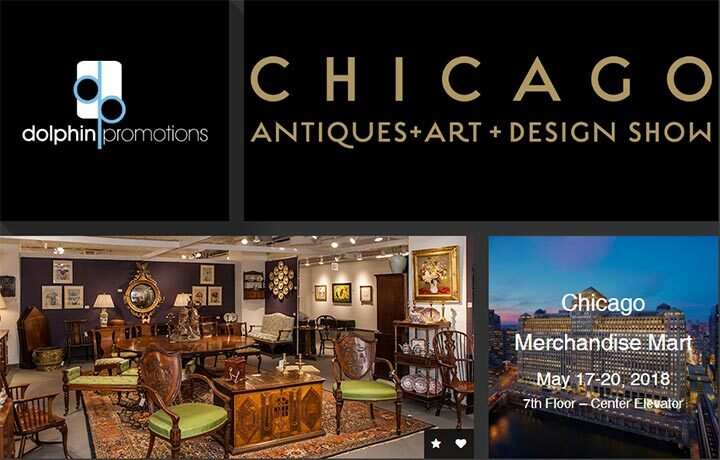 The Miami Antiques + Art + Design Show is over. 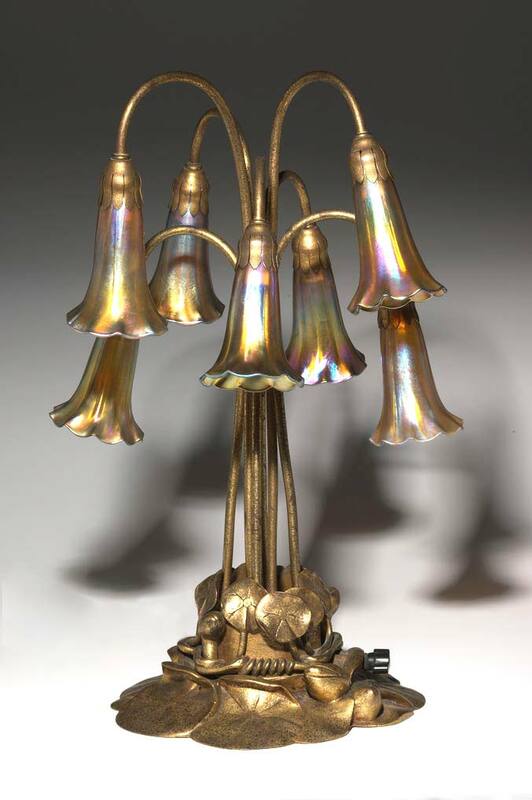 We did quite well, selling across the board including four lamps, French cameo glass and Tiffany lamps, glass and desk pieces. Attendance was fairly decent the first two days, but Sunday was quite slow. Even still we sold every day including two sales on Sunday. Asking around, I heard about 50/50 good comments vs. complaints. Glass dealers did fairly well while painting dealers I spoke to did not. 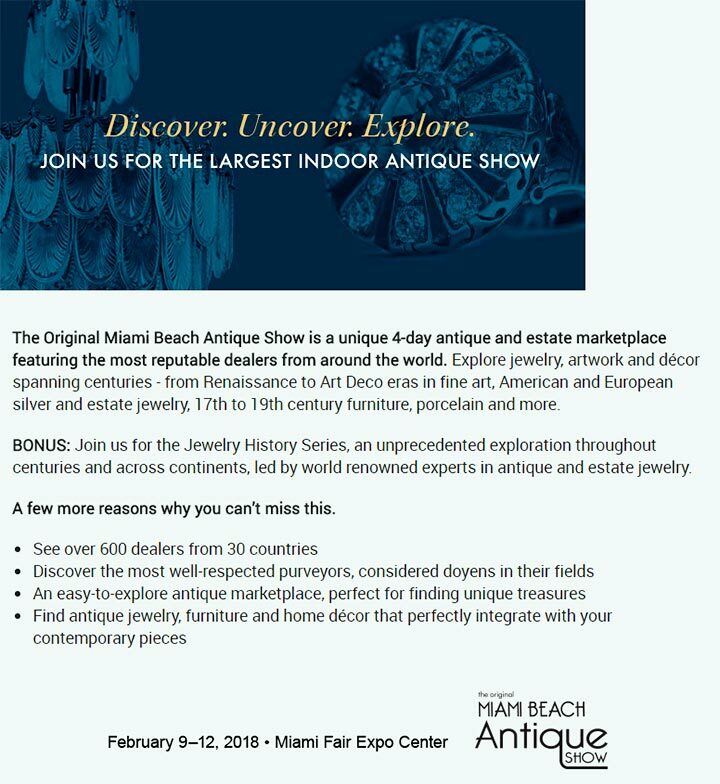 Now we’re getting ready for the big Original Miami Antique show at the Miami-Dade County Fair & Exposition Center. It opens to the public this Friday at 11 AM and continues until Monday at 5 PM. Got my fingers crossed it will go well. It’s a much bigger show than last week’s Airport Show, so there’s more action. If you can only make one show in Miami, this is the one. I’m looking forward to seeing you there. Stop by and say hello. Can’t wait to get back into the renovated Miami Beach Convention Center next year. Construction is supposed to be finished by August, 2018, so I’m hopeful it will come true. More on that in a future blog post.